The all-new ML-Class arrives in the UK with two Special Edition models which offer outstanding value thanks to their extensive range of standard equipment and exclusive features at highly competitive prices. 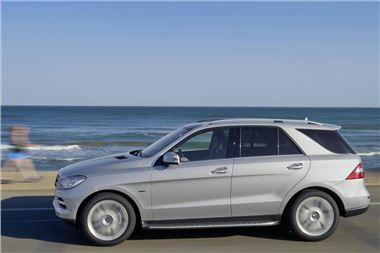 The Special Editions will be available with either the ML 250 BlueTEC or ML 350 BlueTEC advanced turbodiesel engines. The ML 250 BlueTEC costs £43,235 on the road and the ML 350 BlueTEC is priced at £46,335 on the road. To celebrate the arrival of the latest M-Class customers can also opt for the Mercedes-Benz COMAND Online internet connectivity system as an option for just £750 option on all orders placed before the end of June, 2012, creating a customer saving of £1,380. Mercedes-Benz cars equipped with COMAND Online enjoy above-average residual values, allowing highly favourable finance packages through Mercedes-Benz Financial Services. Exterior highlights on both models include aluminium-finish running boards with rubber studs, chrome underguards in the front and rear bumpers, 19-inch five-spoke light alloy wheels, LED daytime running lights, metallic paint in one of four colours (Diamond White paint is available as an £815 option), and the Mirror Package of electrically operated, heated, folding and auto-dimming door mirrors. Their interiors feature Artico artificial leather upholstery with a choice of three colours and the option of full leather for £1,305, brushed aluminium trim highlights or, optionally, four wood finishes priced at £210-£380, a Multi-function four-spoke steering wheel finished in Nappa leather, front seats with full electric adjustment and four-way lumbar adjustment on the driver's side, and an Audi 20 radio/CD system with a 5.8-inch colour display, Becker Map Pilot® satellite navigation, Bluetooth and a USB port. Seven-spoke 19-inch alloy wheels are a no-cost option, or twin five-spoke 20-inch wheels are available for £630, allowing buyers to personalise their car. All the alloy wheels are new designs. Both engines are paired with the Mercedes-Benz 7G-TRONIC PLUS automatic gearbox and feature ECO start/stop technology as part of an extensive package of BlueEFFICIENCY measures. They meet EU6 emissions regulations not due to come into force until 2014 as a result of an AdBlue® aqueous urea injection into the exhaust gas stream. The four-cylinder ML 250 BlueTEC develops 204 hp and 500 Nm of torque and has combined fuel consumption of 44.8 mpg with CO2 emissions from 165 g/km, while the corresponding figures for the V6-engined ML 350 BlueTEC are 258 hp, 620 Nm, 39.2 mpg and 189 g/km. Highlights among an extensive array of standard features include permanent intelligent all-wheel drive with an off-road switch (ML350 BlueTEC only), Direct Steer, steel suspension (lowered on the ML 250 BlueTEC), rain-sensing wipers, automatic climate control, split folding rear seats, an Active bonnet to protect pedestrians in an accident, ATTENTION ASSIST, Downhill Speed Regulator, an electronic parking brake, ESP® Electronic Stability Programme including Acceleration Skid Control (ASR) and Trailer Stability Assist, automatic headlamp activation, Hill Start Assist and PRE-SAFE®.